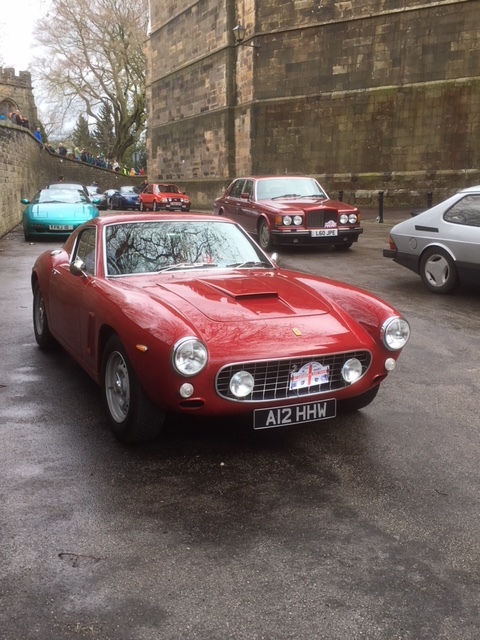 As part of the FBHVC national Drive it Day the Lancashire Automobile Club organises a run on the neares t Sunday to St Georges Day. 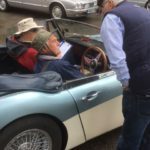 Every year we lay out a new route and as we are based around the Northwest we thought we would resurect the ethos of out Demdyke Rally, In fact one of the first events I marshaled at was Lancashire Automobile Club’s Demdyke Rally way back in the 60’s. That event may be long gone but given the opportunity it is always great to rekindle the spirit. This year we decided to follow in the tracks of the Pendle witches (otherwise know as Demdykes) quite literally. So a lot of research was undertaken to get together the story behind the events surrounding the Witches. Based on this research a route was put together starting from Blackburn Northern Sports in Blackburn and visiting many of the places associated with the witches. For example passing Read Hall where the Magistrate interviewed Mother Demdyke and Roughlee home of Alice Nutter and of course the route they walked to Lancaster over the Trough of Bowland for their trial at Lancaster Castle. Now the route and the story came together with a Route Book which not only gave simple ‘tulip’ directions but also told the story of the Demdy kes. On the day we had over 70 entries and all we needed was good weather. Sadly this was not the case for the early part of the run – we were truly experiencing ‘Mist over Pendle’! We had arranged with Lancaster Castle to use their grounds as a control and to give a classic car show. We had parking for about 30 cars but an entry of over 70. To manage this trick we held the cars until the parking area was full then started releasing cars as more arrived making a sort of moving car show which proved very popular with the waiting public. The Castle is well worth visit by the way and is where the witches were held awaiting trial. Most were found guilty and our final bit of the story took us through Lancaster to Williamson Park – formerly known as Hangmans Hill for a short comfort break. To get back to Blackburn we chose to follow in the steps, or rather wheel tracks of our fore bears by using many of the roads followed by pioneering Lancashire Automobile Club members in an early run to Lancaster in 1903. Back at Blackburn Northern Spots the entrants shared a buffet and stories of the day. All in all a thoroughly enjoyable event. By the way it is very nice of Kate and Prince William to pay tribute to the LAC by naming their some Louis Arthur Charles!